The key to all my frequent blogging has been the new iPod Touch 4th gen. I can take a photo and send it in an email directly to blogger. Yesterday we took a road trip to Turquoise Coyote where I picked up these keys. They are pewter reproductions. (lead-free) I got some for me and some to give away. The winner will get all 3 keys. All you have to do is leave a comment. Facebook, Tweet or make a blogpost for an extra chance to win. Just leave another comment letting me know to increase your chance of winning. The winner will be picked September 30th with the lucky number generator. I think I might be the only person on the planet without an iPod. Or an iPhone. Or any of those i-things. Maybe that would help me do more blogging... I don't blog nearly as much as I want to! I love these keys! Also, I love that you are blogging from the Ipod! I need to figure out how to do this! I dig keys of all kinds. What is more enticing than a key? Perhaps only a lock. I love these keys! I can think of so many things to do with them. Hope I win! I love incorporating keys into projects. They are icons for so many meanings. I've always loved reading your blog!! Hugs! 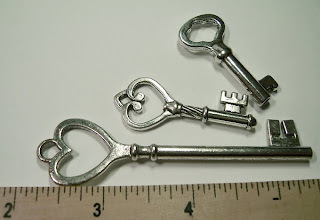 Pretty keys....I've been toying with making some beaded ones. I love keys. Rummage sales are my friend! Oh love the keys! Count me in for a chance to win please! How neat you are using your Ipod to blog!! I love those keys. Also, love my iPhone - so many wonderful things tucked into one item. Love the keys but more interested in the way you blog! I want to know how you do that? I might blog more often if I could do what you do? Is there an app that you need to upload or should I go to blogger to find out more?